With so many TRPG books to go through, I’ve decided to start posting about the various books I’ve got as I go along. First up is Doko ni Demo Aru Fushigi. This is a 50-page doujinshi produced as a collaboration between Tsugihagi Honbo and Majo no Kai. Tsugihagi is Ryo Kamiya’s circle, and responsible for Yuuyake Koyake. Majo no Kai, headed up by “South,” published a print edition of Witch Quest, a free TRPG available as text files. Witch Quest and Yuuyake Koyake are both heart-warming “everyday magic” games, so it was natural for the two circles to collaborate on something. However, the notion of doing so came right when Kamiya was hard at work on Mononoke Koyake, so if they were going to do such a project, it needed to be one that wouldn’t place undue burden on either party. This book is the result. They met online, played a session of each of their games, and had a lengthy dialogue about everyday magic in general, and the book has a transcript of the discussion, sandwiched between two replays. It’s not the most impressive RPG book out there, but for me it was definitely worth the 500 yen. 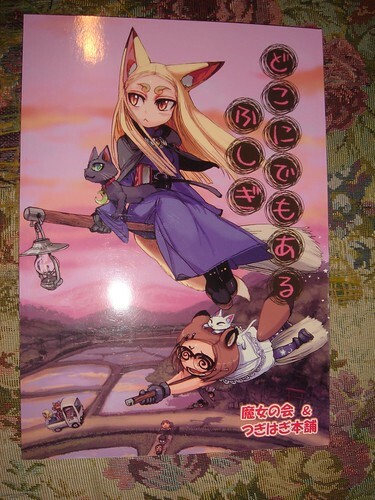 The cover is an incredible piece by Ike, which shows Suzune and Riko from Yuuyake Koyake as witches on brooms, with cat familiars in tow. Ike did two other pieces for this book, which aren’t as polished, but are still very nice. The other interior pieces are by another artist and aren’t that great, frankly, but they do the job. The back cover is another full-color piece by another artist, of above-average doujin level. It’s laid out in more of a traditional Japanese style (top to bottom, right to left), not unlike Sunset Games’ “A Local Paper” magazine. The Yuuyake Koyake replay is called “Yakiimo Koyake” (“Roasted Sweet Potato Sunset”). The PCs were a rabbit henge named Uno and a dog henge named Ruu, both boys, and the story that emerges involves them waiting to have roasted sweet potatoes with a shrine maiden, and figuring out what to do about what appears to be a very young abandoned kitten. The format here is interesting because the body is mostly the dialogue and the GM’s description of things, and the participants’ discussions of the nitty-gritty of the game mechanics is all in footnotes. It’s also interesting to note that the Narrator (GM) has the PCs both start out with a Strength 2 connection to the shrine maiden character (Shino Hiiragi), where normally the rules would call for an Impression Check with any NPC, even if an existing relationship is implied. It’s also the first Yuuyake Koyake thing I’ve seen that includes a henge character that is an adult with a child (the kitten’s mother). The setting really has the potential for tremendous variety, and while the artwork and the sample stories in the rulebook tend towards young henge interacting with kids, you can actually use it for stuff that’s somewhat more mature. The Witch Quest replay is called “Let’s Go to the Pure White Hot Springs!” and concerns a witch names Saras and her cat Nimur traveling to an onsen (hot springs) with unique pure white water to collect herbs to make medicine. I don’t really know Witch Quest, so unlike with the Yuuyake Koyake replay I’m pretty much just enjoying the story. (However, since the game is available as free text files, I may have to put together an English translation… when I have the time). I get the impression that it’s more traditional than YK, but still very much dedicated to heart-warming adventures. If this replay is typical, there’s more of a “detective” aspect, where there’s some problem in the environment that the witch needs to resolve. The book concludes with a single page afterword by South. He explains the circumstances that led to the book coming about (which I’ve outlined below) and ponders issues with making replays (notably, he prefers to stick to what went on in the game session rather than editing it to make it a more interesting read). On the whole, a very interesting read, though that’s partly if not primarily because I’m such a huge fan of Yuuyake Koyake.